EK pre-filled and QDC-enabled GPU water blocks are finally here! EK Water Blocks, premium PC liquid cooling gear manufacturer from Slovenia, is launching pre-filled GPU water blocks featuring Quick Disconnects that are ready to be connected with existing EK-XLC Predator AIO system! Pre-filled and QDC-enabled GPU water block. EK-XLC Predator – XLC stands for Xpandable Liquid Cooling – is finally getting the long awaited pre-filled GPU water blocks that can be connected using the Quick Disconnect coupling or QDC. This is a special connector that allows quick and tool-less expansion of the system without the need for draining the EK-XLC Predator AIO. Carefully selected, the Predator Quick Disconnect is a medical grade product with Zero Drop design! The expansion of the system can now be very quick, easy and safe. Users don’t have to worry about loop order, spilling or damaging their hardware. Starting today, EK is offering the pre-filled and QDC-enabled GPU water blocks as a service on demand for the majority of their popular Full-Cover GPU water blocks. Users purchasing a specific GPU water block will be able to select if they want their desired GPU water block to be pre-filled by EK. GPU water block, selected for pre-fill service will be filled with EK-Ekoolant EVO CLEAR cooling liquid, fitted with two EK-AF Angled 90° G1/4″ Nickel adapter fittings paired with two EK-ACF Fitting 10/16mm – Nickel fittings and with EK-Tube ZMT Matte Black 15,9/9,5mm tube. The longer end of the tube (390mm) will feature female QDC connector and the other, shorter end of the tube (190mm) will feature male QDC connector. This way, the GPU water block will be ready to be connected with the existing QDC connector found on the EK-XLC Predator 360. Quick Disconnect or QDC on the EK-XLC Predator 360. EK has also provided Installation Guides to help beginners set up their first liquid cooling system. 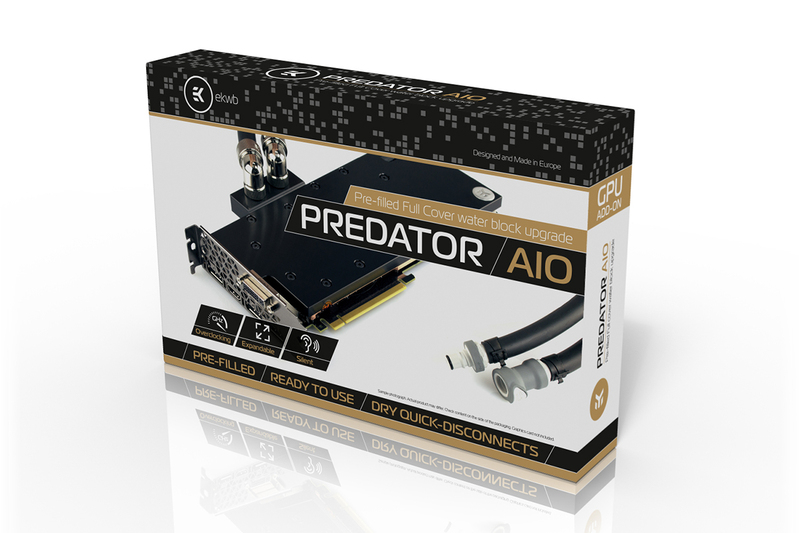 The following video shows how easy you expand the Predator AIO with pre-filled GPU using Quick Disconnects. Service fee for customers who will select their GPU water block to be pre-filled and fitted with QDC coupling, is 29.95€ (incl. VAT). Pre-filled GPU water blocks are readily available through EK Webshop. Pre-filled GPU water blocks for the most popular graphics cards are also available for purchase at Partner Reseller Network.